Shortly before Gervonta Davis exploded the face of Hugo Ruiz Saturday night at Dignity Health Sports Park in Carson, California something occurred to me. We’re smack-dab in the middle of an American boxing renaissance or, at least, we SHOULD be. Yeah, yeah…I know I forgot a bunch, too. But the point is that we currently have a shitload of active, prime, world class talent out there, most of whom with the potential to be top 1%, game-changing, elite-level talent. With this raw talent as building material, this should be a golden era for the American boxing scene. Fans should be flocking to boxing events and gobbling fights up on TV like Dan Rafael going through a sack of fun size Reese’s peanut butter cups. And it’s not like good fights aren’t being made with these guys. Of course, we all know that Crawford and Spence won’t be fighting anytime soon and Gervonta Davis won’t be matched against Vasiliy Lomachenko, but, a lot of these top American guys HAVE been matched against one another and against high-level foreign talent. And, style-wise, this is not a wave of talent made up of pickers and pawers and conservative boxing stylists like the era of Cory Spinks, Devon Alexander, Chad Dawson, etc. For the most part, these young guys are not point-collectors, they understand and embrace the need to display real, effective offense. So, we can’t blame the temperaments and styles of the fighters for not appealing to the casual fan’s thirst for blood and violent chaos. What gives, then? Why isn’t the American scene exploding like, for example, the UK scene? I’ve said this before and I’ll say it again right here. The boxing business model is pure crap. Not too long ago, there was a glimmer of hope as the premium cable business model started to break down, PPV started to crash, and a real investment into boxing on free TV was being made. Maybe the powerbrokers would finally be forced to bite the bullet and invest in something to long-term build the sport, rather than dream up new ways to nickel and dime the loyal fans in pursuit of quick, easy monetary scores. But, nope. Just as soon as one paywall broke down, they built another. The fall of HBO Boxing gave way to the rise of subscription-based streaming services. ESPN’s investment in the sport seems only about funneling subscribers to their pay app and a fledgling ESPN PPV project. Similarly, Fox seems also set on whetting appetites for free so they can pass the hat for the really good stuff on PPV. Beats me how to get the general public interested in a legitimately interesting batch of American talent. Maybe there is no solution. Maybe nobody with any sway in the business is willing, able, or even capable of coming up with some long-term plan that actually builds the sport instead of bilking loyalists. -- Heavy-handed Argentine former world champ, Marcos Maidana, has announced his plans to return to the ring after more than four years out of the game. The former welterweight and junior welterweight champ has re-signed with Premier Boxing Champions and it’s easy to see him brought into a big money bout by the end of next year against any of the PBC’s high-end talent like Keith Thurman, Errol Spence, Manny Pacquiao, or Shawn Porter. Maidana still has name value and will bring his punch back with him, but everything else is a big question mark. Still, “El Chino” never fails to deliver an honest, earnest effort and watching him try to work his way back to the top will be fun. 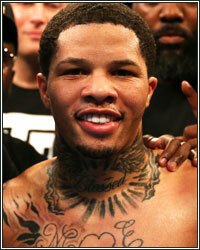 -- Getting back to Gervonta Davis for a sec. I’m fully aware of the impossibility involved in making a Lomachenko-Davis fight, so consider what I’m about to say as something coming from a boxing fantasy land. But, if Davis comes to the ring with his head screwed on right, I think he shocks Lomachenko and puts some serious hurt on him. Davis’ speed and power would make the fight an even-money affair and Davis’ supreme confidence will keep him from coming to the ring half-defeated, like so many of Lomachenko’s foes. -- Oh yeah, one more thing about Gervonta. That “Thriller” ring walk bit? Nope. Davis’ stab at “charismatic”—as he smiled dumbly while walking through that gaggle of dancers-- made him look like a special ed. kid coming off the short bus on a field trip to the zoo. Again. Nope. Let his charisma show while exploding opponents’ faces.